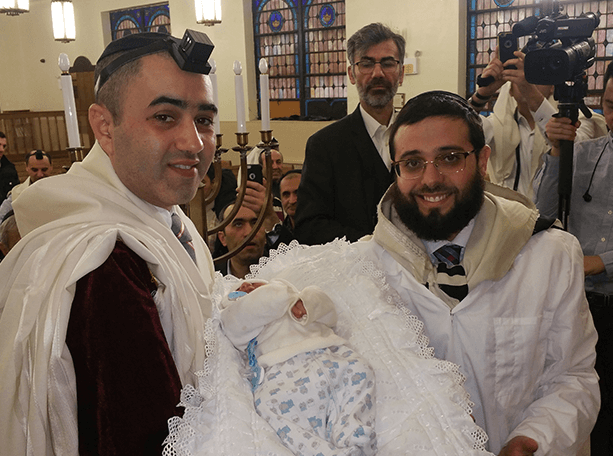 Rabbi Yisroel Perelson has performed the Bris ceremonies in New York over the years. He is well known for his attentive attitude towards infants. Due to his experience and care, this minor procedure becomes quick and almost painless for a baby and turns to be a solemn moment for the whole family. A bris is a symbol, which connects the Jewish male to G-d. When a new soul enters this world in the form of a baby, its greatest wish is to bond with G-d. That connection creates a sense of wholesomeness in a person’s life. The foreskin is the wall between the new baby and G-d. A person with a foreskin is severely limited in his connection to G-d. A bris is infinitely more than a physical surgery; it’s a spiritual surgery that allows us to connect with our infinite G-d. We all want to have that connection with G-d as He possesses the keys to our health, wealth, and peace, and we ask of Him to share those gifts with us. So from the time the child is eight days old we remove that proverbial wall that exists between this child and G-d and we create an everlasting bond between G-d and the baby. A girl is considered to be born circumcised and naturally is born with a connection to G-d. The moment a male Jew is circumcised, he becomes part of a chain that dates back to our forefather Abraham. Abraham, who lived around 4000 years ago, was the first Jew who was commanded by G-d to circumcise himself at the age of 99 and his newborn son Isaac on the 8th day after his birth. This is my covenant which you shall keep between Me and you and your offspring after you. Every male among you shall be circumcised. You shall circumcise the flesh of your foreskin and it shall be the sign of the covenant between Me and you. At the age of eight days every male among you shall be circumcised throughout the generations. Bris Milah (Circumcision) becomes the badge of honor for every Jewish male whether he was born in NYC or any other corner of the world. The circumcision is a mark and a stamp on a Jew’s body demonstrating that we are subservient and connected to G-d. The Circumcision is the one Mitzvah that once performed stays with the individual every moment of his life. There will never be a day that he will be completely devoid of a Mitzvah because he will always have the Mitzvah of circumcision with him. God ordained that sign is to be placed on the reproductive organ of every Jewish male to symbolize that circumcision is essential to Jewish eternity. Kabalah tells us that when a bris is performed on the eighth day, all negative forces leave the person’s body. It is at this juncture that the individual has the opportunity to reach his G-d given potential. Throughout life there are so many encumbrances, which we are confronted with, however, if we have G-d on our side, through the sheer power of the bris, this uniquely unparalleled covenant that we have with Him affords us the extra strength to overcome any obstacle that may stand in our path. All parents have a responsibility to circumcise their male child on the 8th day of the birth of their boy. If they fail to do so then the child assumes the responsibility of obtaining a circumcision once he reaches the age of 13. This Mitzvah is done with great joy and happiness and it is therefore accompanied with a festive meal. Preserving ancient traditions and cultural heritage helps to develop a strong sense of personal identity from early childhood. Thanks to the Bris, many families in NY have experienced an emotional connection with past generations. As a unique and meaningful tradition with deep historical roots, the ceremony brings people together and enables them to reconnect with their heritage. The Bris in New York creates a sense of unity for each family who welcomes a new member, raise and educate children with Jewish values. During the bris, your baby will receive his Hebrew name and thus take the first step into honoring our ancestors. Whether you are looking for a highly qualified Mohel for your firstborn son, twins, or an adopted baby, make sure that here you will find the comprehensive answers to all your questions as well as helpful guidance for the spiritual event, which establishes a child’s cultural and religious identity. Get in touch with the Mohel for a free consultation.